Give your morning ritual a woodland feel with Colleen Huth's handmade mugs pressed with real wildflowers. To find a flurry of pretty dragonflies, a bunch of happy bees, or a beautiful blue wildflower patch: get to a woodland glade. 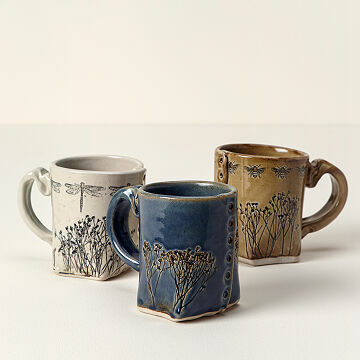 Or sip from one of these nature-inspired mugs by Colleen Huth. Handcrafted from stoneware, they start as flat pieces of clay. She then presses the outsides with real flowers and a custom dragonfly, and folds them, leaving an organic edge. The black silhouettes rest against a natural cream glaze which gives them the feel of drawings from an artist's sketchbook. They make a one-of-a-kind gift for a tea lover or friend who'd love to get lost in the wildflowers. Handmade in Fond du Lac, Wisconsin. The mugâ€‹ is beautiful and very detailed. I love my new Honeybee Pressed Wildflower Mug!!! I am certain my Cousin will be excited about this special memento to spoil her at 70! It was a lovely in person as I expected. The mugs are substantial (sturdy) yet delicate (in design - wild flower imprints). Colors are comforting. The details are profound rather than demure. Beautiful mugs that are very well made. The packaging for delivery was beyond expectation, they definitely respect your product and want it to be in pristine shape when it arrives. Even more beautiful in person! Very comfortable to hold and drink from. Will definitely buy a few more for gifts. I love the mug itself. It is discolored around the bottom and up the side where it is put together. Almost looks like it is stained with tea or coffee. Would have given 5 stars had that been cleaned up better. The prices in the catalog are on the high side, so occasionally I buy from you. I can purchase excellent handmade gifts locally, and they are usually much cheaper. The pressed flower & dragonfly design attracted me initially. Then I was drawn to the actual construction of the mug, it is so very unique. My only criticism is the inside bottom of the mug is not flat and smooth so it makes stirring a bit awkward. A minor inconvenience I am more than willing to overlook because of the overall distinctive design. This is my new favorite morning mug. Makes me smile first thing. Love the cups, I ordered two more.